A CANDU nuclear reactor was shut down for over one year because steam generator (SG) tubes had failed with outer diameter stress corrosion cracking (ODSCC) in the U-bend section. Novel, single-pass eddy current transmit-receive probes, denoted as C3, were successful in detecting all significant cracks so that the cracked tubes could be plugged and the unit restarted. Significant numbers of tubes with SCC were removed from a steam generator in order to validate the results of the new probe. Results from metallurgical examinations were used to obtain probability-ofdetection (POD) and sizing accuracy plots to quantify the performance of this new inspection technique. Though effective, the above approach of relying on tubes removed from a reactor is expensive in terms of both economic and radiation exposure costs. This led to a search of more affordable methods to validate inspection techniques and procedures. Methods are presented for calculating POD curves based on signal-to-noise studies using field data. 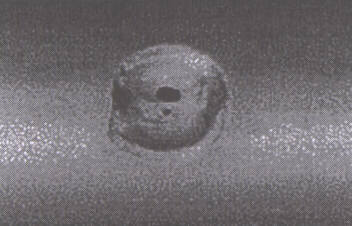 Results of eddy current scans of tubes with laboratory-induced ODSCC are presented with associated POD curves. These studies appear promising in predicting realistic POD curves for new inspection technologies. They are being used to qualify an improved eddy current array probe in preparation for field use. Requirements for aging nuclear steam generator (SG) tube inspections are becoming increasingly stringent throughout the world, including Canada. The effort of removing tubes, and the special handling required of these radioactive samples makes validating an inspection with in-service tubes an extremely expensive exercise. Canadian designed CANDU reactors have steam generators composed of various tube materials. The dimensions and material composition of the tubes can greatly affect design features in the probes required to ensure that eddy current inspections will be reliable. For example, steam generator tubes in the Pickering Nuclear Generating Station (PNGS) are composed of a ferromagnetic copper-nickel alloy called Monel 400. Because these tubes are ferromagnetic, powerful permanent magnets need to be integrated into eddy current probe designs to magnetically saturate the tube material [1,2]. Magnetic saturation is required to ensure adequate eddy current depth of penetration in order for internal probes to detect defects that initiate from the outer diameter (OD) surface of the tube. It is also needed to eliminate probe signal distortions from magnetic permeability variations that can obscure defect signals. 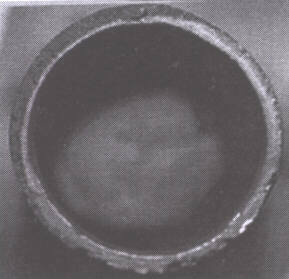 Another important and unique characteristic of CANDU steam generator tubes is that they all have deposits of magnetite on the internal diameter (ID) surfaces. These magnetic layers partially shield the tube walls from the probes' electromagnetic fields, thereby weakening probe responses to defects. In addition, variations in the magnetic permeability and thickness of the deposits can cause distortions in the signal background that obscure defect signals. When validating inspection techniques, the appropriate field conditions must be considered. In the case of CANDU SG tubes, the effects of ID magnetite deposits must be included in validating eddy current inspections. For some specific CANDU sites the effects of ferromagnetic tube material and/or electrically conducting deposits must also be mcluded in validation exercises. Figure 1: C3 probe showing coil configuration. Figure 2: Computer modelling results comparing signal (from a crack)-to-noise (from probe lift-off or ID magnetite deposit) for a pancake impedance coil probe and a transmit-receive eddy current probe. Most in-service heat exchanger and steam generator tube inspection is carried out using bobbin coil eddy current probes. These probes consist of coils of wire that are coaxial with inspected tubes. Eddy currents that bobbin probes mduce jn the inspected tubes are circumferentially oriented. Unfortunately, circumferential cracks do not interact with the circumferential eddy currents generated by the bobbin coils rendering these probes insensitive to these types of cracks. Because of this shortcommg with bobbm coil probes, mechanically rotating pancake coil (RPC) probes have been implemented world-wide for inspecting tubes that are suspected to have circumferential cracks. Eddy currents induced by these probes have circumferential and axial components that interact with cracks oriented in all directions. 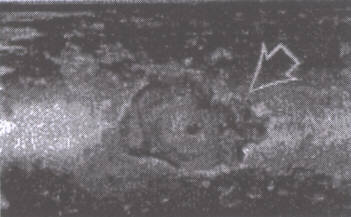 In 1991, steam generator tubes at the Bruce Nuclear Generating Station (BNGS), Unit 2 developed leaks due to circumferential outer diameter (OD) stress corrosion cracks (SCC). Inspections of these tubes with industry standard RPC probes failed to detect any of the cracks except for some that had propagated completely through the tube wall. The reasons for such poor performance of these probes were that the cracks were located in deformed sections of the tubes, and variations in the ID magnetite deposits also obscured crack signals. A new transmit-receive eddy current array probe, denoted as C3 (Cecco-3), was developed for this application . This probe consisted of two circumferential arrays of transmit (active) and receive (passive) coils as shown in Figure 1. The reason that the transmit-receive configuration was chosen was that computer modelling showed that transmit-receive probes were several times more sensitive to cracks in comparison with lifl-off (coil to tube wall proximity variations due to tube deformation) and magnetite deposit variations. Calculated signals from cracks, liftoffand magnetite deposits are shown in Figure 2 for pancake impedance and transmit-receive eddy current probes. These results clearly show that the signal (from the crack) to noise (from lifl-off amd deposits) ratio is several times better when using a transmit-receive probe than when using a pancake impedance probe with coils of the same size. The new C3 probe was validated by using it to scan several hundred SG tubes at BNGS-2, removmg over 100 Ubend sections of the mspected tubes, and destructively analyzing the removed tubes in a laboratory. Probability-ofdetection (POD) histograms based on the comparison of the inspection results with the laboratory measurements are shown m Figure 3. A depth sizing accuracy plot is shown in Figure 4. Figure 3:	Probability of detection histogram for C3 probe detecting OD stress corrosion cracks in Bruce A Nuelear Generating Station steam generator tubes. C3 probe showing coil configuration. Figure 4:	Sizing accuracy curve for C3 probe detecting ODSCC in CANDU SG tubes which were subsequendy removed and analyzed destructively. Though effective, the above approach of relying on tubes removed from a reactor is expensive in terms of both economic amd radiation exposure costs. This led to a search of more affordable methods to validate inspection techniques and procedures, some of which are described in the following sections. Figure 5a: Dye penetrant photograph of a steam generator tube sample with laboratory induced outer diameter stress corrosion cracks. Figure 5b: Fracture cross section of a circumferential stress corrosion crack in a steam generator tube. Figure 6a: Photograph of a laboratory-induced, 100 % OD pit in a Monel 400 SG tube. Figure 6b: Photograph of a 100% OD pit in a tube removed from PNGS-B. Both pits are of similar diameter. One alternative to technique validation based on tubes removed from in-service steam generators is to prepare samples m the laboratory with properties that simulate the field conditions encountered in inspections. For CANDU SG tubes, methods have been developed that produce ODSCC (circumferential and axial) in Inconel 600, pitting in Monel 400, amd fretting wear. Figure 5 shows a dye penetrant image and a fracture surface of an Inconel 600 tube with laboratory-mduced stress corrosion cracks. The darkened area on the fracture surface outlmes the circumferentially oriented crack. Figure 6 shows a comparison of a pit found m a Monel 400 tube section removed from an in-service steam generator, and a laboratory-simulated pit. The two through-wall pits have similar diameters and volumes. A method for depositing magnetite layers on steam generator tubes has been developed. Tube samples are immersed in a aqueous magnetite suspension. Afler the appropriate exposed surfaces of the tube have been coated with the magnetite particles, the tube is heated in a furnace to dry and smter the magnetite coating. A comparison of eddy current measurements with these laboratory-induced layers has shown that they cause as much or more distortion in eddy current signals as the deposits encountered in the field. Copper layers have been deposited on tube surfaces with an electroplating method. The addition of mockup carbon steel support plates and deformations with the realistic defects and deposits allows the production of laboratory tube samples that properly simulate the field conditions encountered in CANDU SG tube inspections. Backgroumd noise in BNGS SG tubes at the HU I support plate locations was quantified in terms of population (number of tubes) plotted as a function of noise amplitude. These noise population plots were used to predict probability of detection as a function of signal amplitude (Vertical component (Vmx)) by defining a mmimum signal-to-noise ratio to determine detectability. The detection probability was calculated from the normalized area under the population plot. This was calculated by integrating the population function from 0 Volts to the signal voltage (from the calibration curve) divided by the minimum signal-to-noise ratio required for detectability. The normalization is performed by dividing these integrals by the integral from 0 Volts to infinity. To validate this methodology for calculating probability of detection, the background distortion of signals from 4 T/R unit C3 probes (version I ) was quantified. Figure 7(a) is a plot of the noise distribution. From this plot, POD curves, shown in Figure 7(b) were plotted for signal-to-noise ratios of 1.4 and 2. Superimposed is the POD curve that was derived from comparing eddy current predictions with destructive analysis of tubes removed from BNGS-2 in 1992. This plot shows that this is a reasonable technique for makmg conservative estimates of POD curves. Figure 7:	(a) Noise distribution plotted for 4 T/R unit C3 probe (version 1) at the HU1 support plate location in BNGS-2 SG tubes. (b) POD curves for 4 T/R unit C3 probe (version 1) detecting circurnferential OD stress corrosion cracks at the HUI support plate locations in BNGS-2 SG tubes. Technique validation for SG tube inspection usmg in-service components is extremely expensive. However, care must be taken to ensure that validation exercises using laboratory-prepared tubes must accurately simulate the field conditions tnat will be encountered in in-service inspections. Laboratory induced defects, especially cracks, must closely resemble in-service defects. Equally important is the need to have the significant field-like tube deformations, expansions, deposits, and support plates that can obscure defect signals. A method has been proposed that may make validating inspections much more economical. A comparison of defect signals with the background noise obtained from real in-service tube scans can help to establish the limits of defect detectability. Cecco V.S., Van Drunen G. and Sharp F.L., "Eddy Current Testing Manual, Vol. 1", AECL Report, AECL-7523, 1981, Chalk River, Ontario, Canada. Cecco V.S. and Van Drunen, "Recognizing the Scope of Eddy Current Testing", in Research Techniaues in Nondestructive Testing, Vol. 8, 1985, pp 269-301, ed. by R.S. Sharpe, Academic Press. Obrutsky L.S., Cecco V.S., Sullivan S.P. and Humphrey D., "Transmit-Receive Eddy Current Probes for Circumferential Cracks in Heat Exchanger Tubes", Materials Evaluation, Vol. 54, No. 1, pp 93-98, 1996 January.